What does breakfast mean? Breaking our fast, of course. Coming out of an 8-9 hour period where food intake is halted, our body begins to upregulate various hormones and enzymes for nourishment. 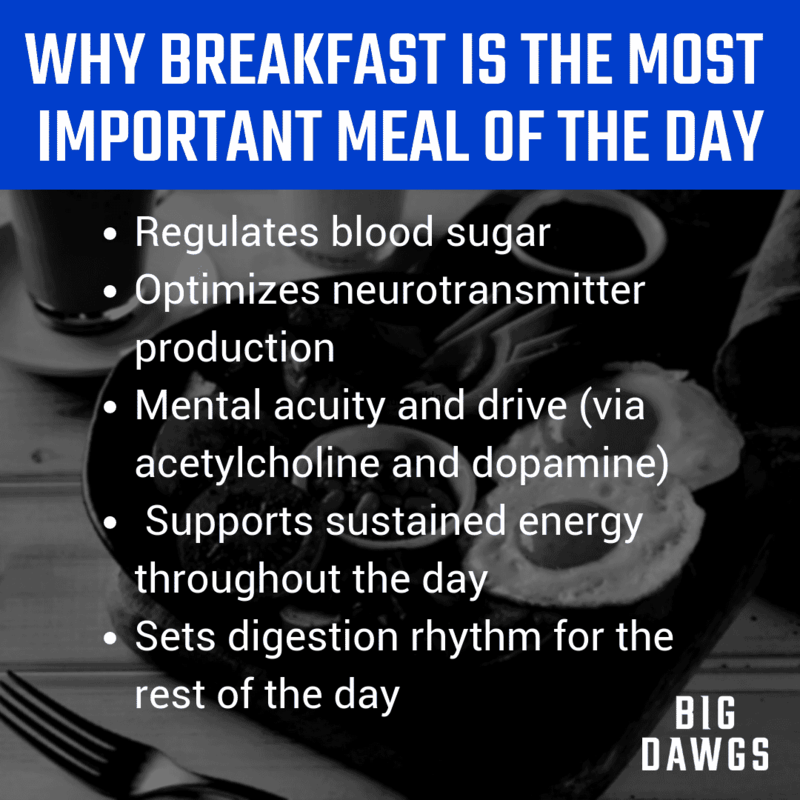 The late and great strength coach, Charles Poliquin, said, “The first thing you put in your mouth in the morning…provided it is food…dictates all neurotransmitters for the whole day.” What we can extract from that is our ability to function cognitively and physically will be optimized or minimized based upon what we consume first thing in the morning. So, let’s break down why certain foods in the morning will be more beneficial than others. One of the hallmark approaches to a healthy breakfast, again popularized by Charles Poliquin, is the meat and nuts breakfast. This meal focuses on high quality protein sources from meat in addition to high quality nuts, mono-unsaturated fats. The reasoning behind this combination again stems from the neurotransmitter production that will begin once ingesting these foods. High quality organic meats (grass fed, free range, wild caught…you know, the good stuff) – are high in aromatic amino acids (phenylalanine, tryptophan) which are both precursors for the biosynthesis of Dopamine. High quality nuts (largely consisting of mono-unsaturated fats) – are high in choline which is a precursor for acetylcholine production. Choline – a vitamin-esq essential nutrient. Choline serves 3 purposes: structural integrity and signaling roles for cell membranes, cholinergic neurotransmission (acetylcholine production) and a source of methyl groups via its metabolites. Acetylcholine – a neurotransmitter synthesized in the brain. This neurotransmitter plays a vital role at the neuromuscular junction. It is the chemical that motor neurons of the nervous system release in order to activate muscles, kind of a big deal. Adequate production and utilization of acetylcholine are needed in order to optimize muscle action, and that’s only one part of acetylcholine’s job. Acetylcholine also plays a part in the autonomic nervous system. It acts as an internal transmitter for the sympathetic nervous system (fight or flight) and is the final product released by the parasympathetic nervous system to stimulate specific organ receptors (4). Additionally, a number of cholinergic (pathways mediated by acetylcholine) areas of the brain are responsible for attention, memory, and arousal (always a good thing). Quality meats provide us with the building blocks for dopamine, a powerful neurotransmitter that is responsible for motivational reward, drive, and focus. Quality fats provide us with the building blocks for acetylcholine, a powerful neurotransmitter that is responsible for muscle activation, motor control, attention, and memory. Now, outside of the obvious benefits from these food choices, is there utility with including other foods in our breakfast? Yes. The main takeaway here is we want to ensure we are getting quality protein and fats with breakfast to 1) satiate us, 2) stabilize blood sugar, 3) provide valuable energy and mental acuity, and 4) necessary precursors for important chemicals and reactions in the body. This is going to set ourselves up for success for the day by keeping cravings at bay, optimizing blood sugar balance, ensuring mental acuity is high, and helping to maintain great emotional balance (major fluctuations in blood sugar can cause fluctuations in emotions) (5). It goes without saying to include quality colorful vegetables, and starchy carbohydrates with your meal for those that need additional carbohydrates with breakfast. For some, a quality source of protein, fats, and vegetables can suffice for their morning meal. Last note, for those who might be doing morning fasted aerobic work, this can be implemented after your training session.